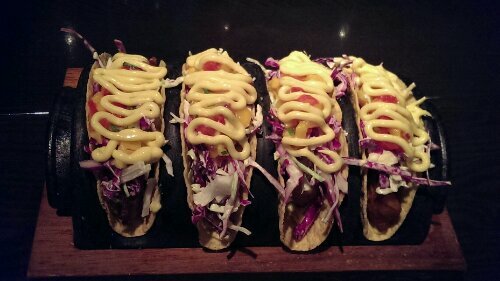 @Hong Kong | Get Your Grub On! During our last visits funnily having weird random food at ‘Tsui Wah Eatery’ has become part of the normal schedule. 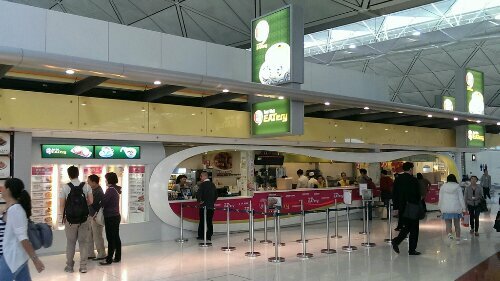 This time we didn’t really get around to it during our stay but were given a last chance at their airport branch which I had never recognized before. 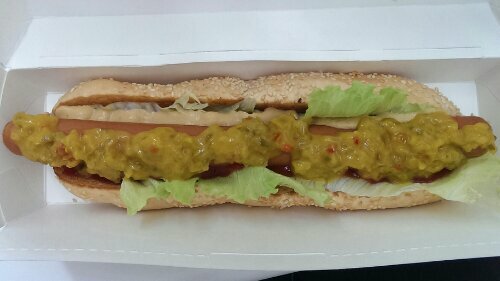 I ordered their ‘Jumbo Frankfurter Hot Dog‘ which I remembered being not too bad. 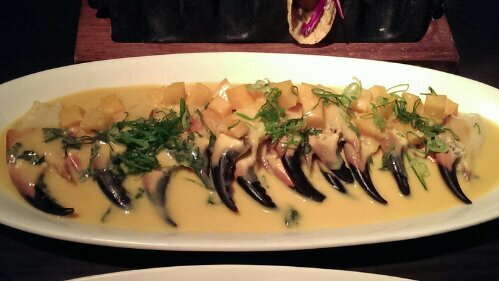 Actually it was better than my memory suggested, humongous indeed with its’ 11 inches and with great flavors. The sesame bun was nicely toasted and held up it’s part of the deal pretty well. The frank bedded in crunchy lettuce actually was great too, it was pretty well seasoned and the casing snapped perfectly. So far this was a good yet still ordinary dog but what made it truly delicious was the mix of condiments they used, sweet tomato sauce – or “ketchup” as I would call it – a sweet and sour mustard pickle relish and a brilliant nose -hair-curling horseradish cream. Totally satisfied. Spicy noodles made it to the island. 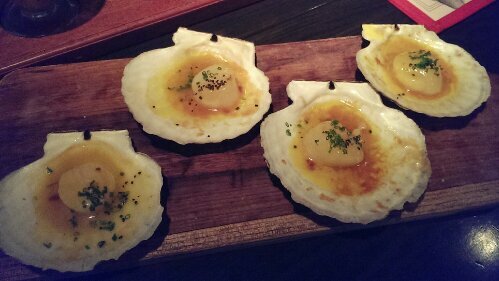 This is not going to be a full review as I have already posted about their location in TST but this is great news I thought you should know. They have opened another shop in the Food Republic at City Plaza in Tai Koo and this is awesome for many reasons: First the trip to have spicy noodles is much shorter now when you’re staying on the island and secondly this is a much cleaner setup. The latter comes together with a loss in character, so no manga paintings on the wall, no grumpy waiters and no sticky tables (not overly sticky anyway) but on the other hand the ingredients seem to be much fresher and taken care of here, especially the greens like coriander are actually green and heaps compared to the small welk portions you get at the original shop nowdays. So up to your preference but I for one had enough character experience at this place and will probably visit this new and “fancy” shop more often from now on. Thanks RJ and CL for pointing me into the right direction. Yeah! Our friend brought us all to her Dad’s favourite Shanghainese restaurant in Wan Chai tonight for some pure and traditional food. 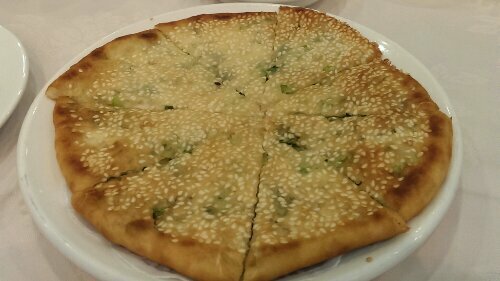 The ‘Scallion Pancake‘ was awesome with a nice toasty crust and some chewy dough inside, fitted with enough scallions and sprinkled with loads of sesame. The french beans with minced meat were also tasty, savoury and rich from the meat and gravy with a snappy texture from the beans. 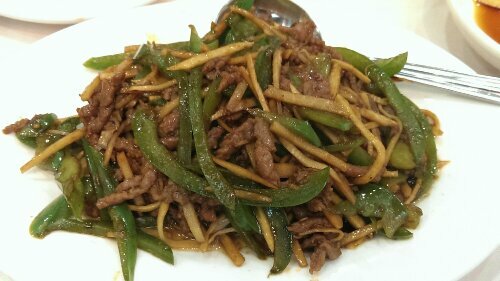 I really liked the beef dish here, not particularly because of the meat, nor because of the peppers but rather because of the bamboo that was so thinly slices it came across like noodles and made it all really nice. I was slowly starting to think that every dish here comes with a very similar gravy, thankfully a very tasty one. After a plate of lovely chewy stir fried rice cake finally their signature dish – ‘The Lion’s Head‘ – showed up at our table. 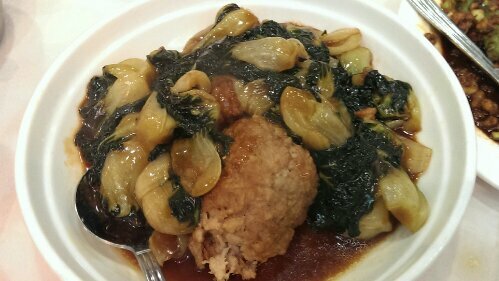 I had never heard of this before but it was pretty much an oversized, softly tender Chinese meatball covered in bok choy and the same delicious gravy that we knew so well now. ‘Lao Shang Hai’ is no thrills for sure but offers great and solid homecook style Shanghainese fair with highly friendly and dapper waiters in a traditional atmosphere. Pretty good. High Tea at City Hall. Finally it was dim sum say and our host took us to City Hall to go to ‘Maxim’s’ as I turned out a great place for high tea. The queue was massive and we had to wait for a good hour before we could get a table. The place is elegant, a huge bright room with hundreds of people sitting and eating and running around in between. 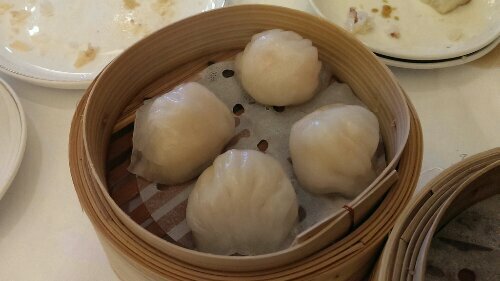 We tried heaps and heaps of baskets of which the first was the above with the steamed ‘Prawn Dumplings‘ which were stuffed ’til bursting with big prawns. 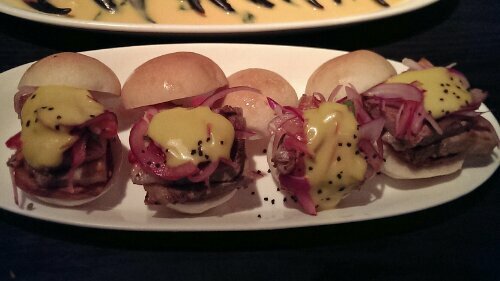 I always find their texture really odd but tastewise they were fantastic. 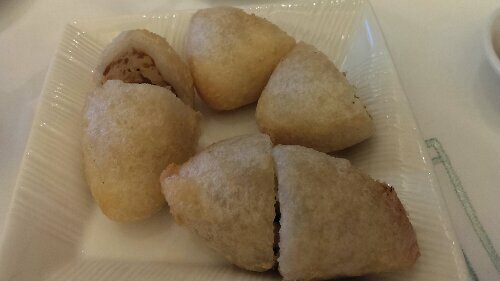 The pork filled pockets were my and everybody’s favourite, the dough was super chewy and stuck to your teeth and the meat gravy filling was delicious too. 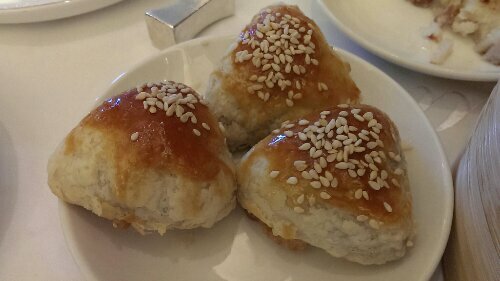 Another bbq pork filled option were the pastry buns which were good but together with the glazed pork inside the sweetish pastry was just a little bit too much. I didn’t really like the ‘Shao Mai‘ but then I never actually do cause their awkward pork-prawn-mix that weirds me out. 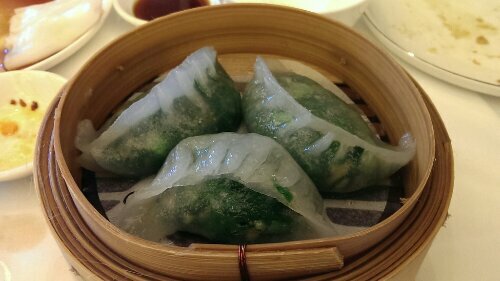 The vegetarian option for the day were the steamed mushroom dumplings that had some lovely crunchy texture and the above waterspinach version that was fresh, juicy and simply delicious. This was a great place to get dim sum, the nice ladies with the trolley’s full of goodies hovering around and just really really good food. Recommended. Mango Mania and Chewy Balls. 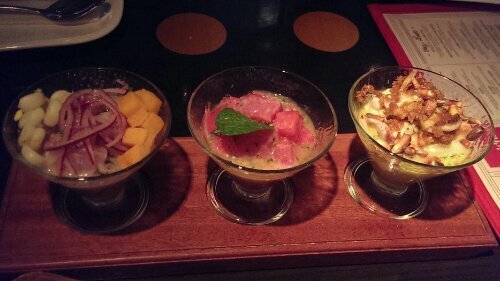 I wasn’t too excited when our friend suggested some Hong Kong style dessert after dinner because I thought everything would be filled with some sort of beans or corn or whatever but boy, was I wrong. She brought us to Hui Lau Shan (許留山) and it was a-mazing. 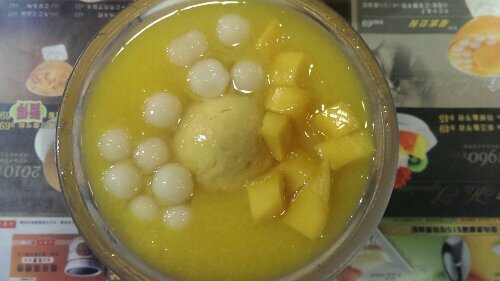 Everything seemed to be made out of Mango and I went for the ‘Mango Chewy Ball’, a nice mixed bowl of sweet fresh mango, funny chewy glutinous rice balls, mango ice cream and an amazing cold mango mousse. 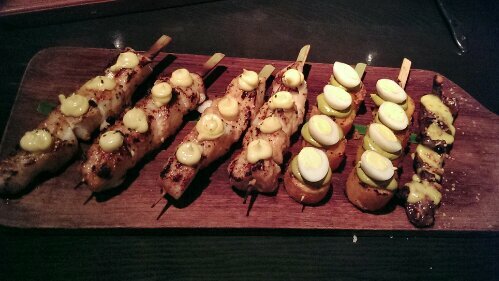 Even though it might not have been, everything tasted natural, fresh and sort of healthy. My new favourite dessert place that is. Dan Dan surprise from Sister Wah. 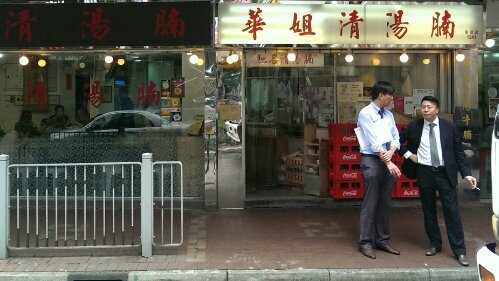 I’m always up for some brisket noodles and since the ladies felt a bit sick today I ventured a couple of MTR stops out east to pickup some ‘Brisket Noodles‘ from ‘Sister Wah’s’ at Tin Hau. 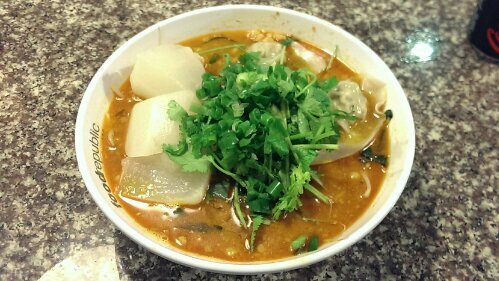 When there, I realized they also had some ‘Dan Dan Mian‘ on the menu, so in the cart with it and back home. 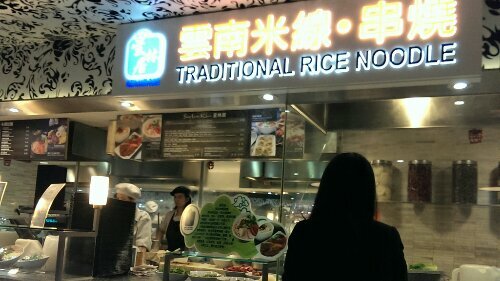 The ‘Brisket Noodles‘ were okay but a bit watery so nothing too exciting. 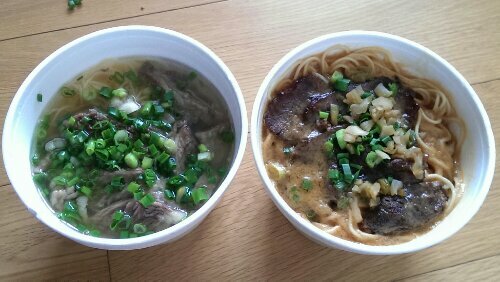 The brisket was tender though and not too fatty and I appreciated the many chives they had sprinkled over it but the winner of this takeout clearly was the ‘Dan Dan Mian‘. The noodles were the same but as this was a dryer version they had a much better bite and texture and the thick gravy had a mild heat and was wonderfully rich in sesame flavour, delicious. The beef shank wasn’t too bad either but could’ve been leaner. 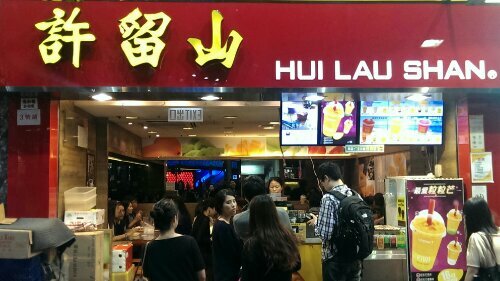 The shop was pretty basic and oldish but the people at the counter were super helpful and the food was decent. Great stuff.